Photographs capture important moments in our lives, and engraved picture frames can help retell the story or commemorate an event. At Engravables Plus, you'll find a variety of engraved silver picture frames in a number of different sizes and styles, as well as black and wooden engraved picture frames. In addition to standard-sized frames, we also offer a number of frames with an oversized engraving area for longer messages. An engraved silver frame is a great gift for a birthday, wedding, graduation, or just as a reminder of a wonderful time in someone's life. Many colleges and businesses also find that the gift of an engraved photo frame is an excellent and memorable way to mark momentous events. We do not charge for engraving, so there are no hidden costs. Bulk discounts allow you to save as much as 20 percent on large orders, and shipping is free with orders of $99 or more, so order today! Wake up to a friendly face! Non-tarnish nickel-plated engravable silver hinged alarm clock holds a 3" x 5" inch photo on the left side and a battery operated alarm clock on the right. Velvet backed. Great as a personalized award too, for any performer, achiever, student, friend, colleague, lover, friend, sorority sister. 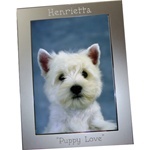 Engraved Brushed Aluminum picture frame has a combed textured look with a shiny inside border around the photo. Can be vertical or horizontal. Offers a large space above and below the photo for engraved names, dates, occasion, verse, motto, logo. Holds a 4x6 Photo (Actual opening is 3 1/2 X 5 1/2 inches). Black metal photo frame for a 5X7 inch photo. Can go vertical or horizontal. This oversized frame has a large engraving area. Black flocked easel-back. Personalized gift for corporate event, anniversary, wedding, bridesmaids, family reunion, sorority, fraternity photos. Black photo frame for a 4X6 inch photo. Can go vertical or horizontal. This frame has a large engraving area. Black flocked easel-back. Personalized gift for anniversary, wedding, bridesmaids, family reunion, sorority, fraternity photos. Frame accommodates logos beautifully. Silver-tone metal picture frame for a horizontal 4x6 inch photo. Non mirror - lightly textured look. Photo slides out the bottom. Large engraving area. Elegant, semi-gloss finish silver frame for photos or pictures. Holds a 4X6 inch photo. Full glass to edges. Elegant, semi-gloss finish silver frame for photos or pictures. Holds a 5x7 inch photo. Full glass to edges. 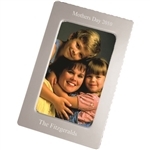 ITEM #: FM2265 Elegant, shiny smooth silver-plated frame for photos or pictures. Holds a 5x7 inch photo. Full glass to edges. Bright reflective nickel-plated photo picture frame with black flocked easel back. Frame is able to be engraved either horizontally or vertically.Can hold up to 2 lines of engraving at top and 2 on bottom. 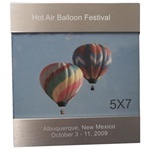 Beautiful 4 X 6 nickel-plated silver photo picture frame with black flocked easel back. Can hold up to 2 lines of engraving at top and 2 on bottom.Vertical or horizontal. Beautiful 5 X 7 nickel-plated silver picture frame with black flocked easel back. Can hold up to 2 lines of engraving at top and 2 on bottom. Beautiful 5 X 7 silver-plated engravable photo picture frame with black flocked easel back. Can hold up to 2 lines of engraving at top and 2 on bottom. 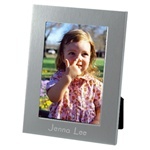 Beautiful 4 X 6 silver-plated engravable photo picture frame with black flocked easel back. Can hold 1 line of engraving at top and 1 on bottom. Beautiful 8 X 10 silver-plated engravable photo picture frame with black flocked easel back. Can hold up to 2 lines of engraving at top and 2 on bottom. A lot of style in a little frame! Compact matte engraving area with shiny trimmed frame for photos or pictures. Engravable above and below the photo. Overall only 6x8 big. A personalized silver 8x10 frame for larger photos. Narrow matte engraving area with shiny trimmed frame for photos or pictures. Engravable above and below the photo. Overall size is 9-7/8" x 11-3/4". Whether you need a personalized frame to fit a 4X6, 5X7 or 8X10 photo, we have a frame that can be engraved for you. There are alternative finishes - shiny silver, matte silver or aluminum photo frames to choose from. Many of our customers are companies and organizations that wish to celebrate or remember a special occasion with an engravable photo frame. You can also consider this as a gift for your wedding party, the family picture, a special event in someone's life. With our discounted prices, free engraving and quality, you'll be happy you chose an engraved frame from Engravables Plus!